When we talk about the ardeids we are used to imagine elegant birds, with long slender legs, sinuous and flexible neck, with small and tapered head provided of a long and pointed bill similar to the tip of a spear. This particular conformation of the bill is by sure the main characteristic of the membres of this group but is also one of the easiest and simplest references for classifying on the field the membership of a bird to this family. This does not apply to the Boat-billed heron or Boatbill (Cochlearius cochlearius Linnaeus, 1766) an extravagant heron belonging to the order of the Pelecaniformes and rightly to the family of the Ardeidae. Previously, it had been placed in a specific family of its own, the Cochlearidae. If we should have to express an aesthetic consideration about the first meeting with this odd bird, we could trace the typical human disappointment when, observing from the back the body of a nice girl, we realize as soon as she has turned towards us, to have in front of us an impossible and hideous face with an ungainly and clumsy profile, a real nightmare. Indeed, the boatbill seen from behind is nothing else than a small heron very similar as shape and colours to our Night heron (Nycticorax nycticorax), with a little blunted body when resting and with the head sunk between the shoulders. The surprise is gotten when the specimen turns the head towards us and shows its incredible and hideous profile. An unthinkable bill, incredibly shapeless and big for its dimensions. Only in another instance the nature makes us these pranks, however with a bird always belonging to the order of the pelecaniforms but to the family of the balaenicipitids, the Shoebill (Balaeniceps rex), also hideous from this point of view and dissimilar from its peers. That is why the vulgar nickname given to the Boatbill either in Italian or in various other languages, reflects this unusual characteristic that renders it immediately unmistakable. This bird is known still now in its South American origin lands with the name of savacou, whilst in Europe it had been initially called Cancroma, now its synonym but already in the common names given by the various countries, its predominant characteristic was resumed. In English, Boat-bill Heron, in Spanish, Martinete Cucharón, in German, Kahnschnabel; in Portuguese, Arapapà, in French, Savacou huppé, in Italian, Cancroma or Becco a cucchiaio and in Japanese an amusing Hirohashisagi. The etymology of the name cancroma on the other hand resumed the Latin term canceroma, from cancer-crab to indicate one of the choice preys of this bird. Whilst “cochlearius” from the Latin “cochlearium” = spoon, ladle rightly for the shape of the bill. 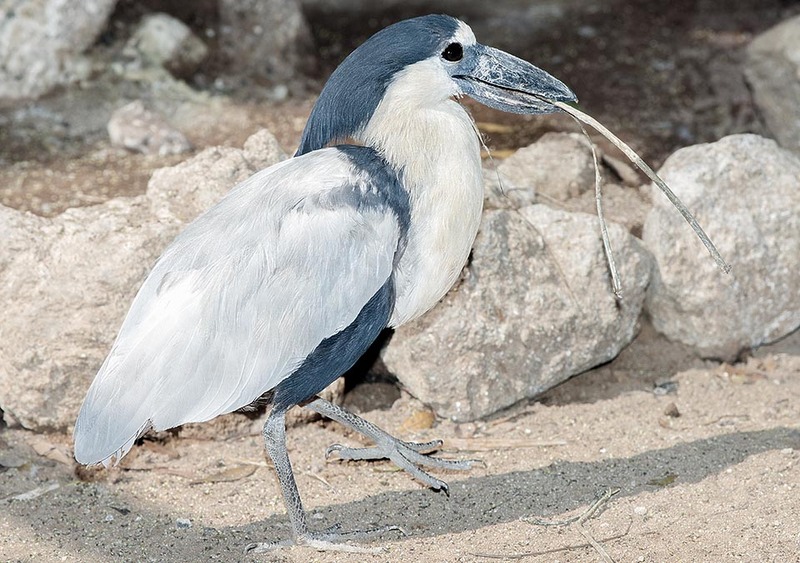 Typical American bird, the boat-bill heron occupies wholly the tropical area of this continent, with a territory that, starting from Mexico reaches the borders of Argentina covering systematically every intermediate region. It is absent in the Caribbean islands, apart Trinidad, in the mountain cordilleras and in the Andean highlands. Strangely enough, it is absent also in the eastern part of Brazil, nation stronghold of its range. It is a bird considered as sedentary even if subject in particular seasons to small movements that see it gathering in very numerous groups in some well known areas. Like a real heron and even more as the similar night heron, the boatbill lives systematically in waterlogged environments, with thick canopy cover, low on the level of the water and with intricate ramifications such to allow it an easy walkway scampering from branch to branch, with the help of the very long toes nature has given him. The coastal mangrove forests are mainly their world and here they spend most of their life. They do not disdain the banks of the tropical water ways, of the lakes and of the marshes where the vegetation reflects the characteristics of the mangrove swamp. Essential elements of its presence are the water and an overlying vegetation that allows them to stay perched and hidden. They spend most of the day inside this vegetation, motionless and totally invisible to reappear then suddenly all together in the twilight hours and during the night like ghosts out of the water. However, it is not a talkative animal except during the nesting, therefore for most of the day it goes unnoticed, if not accidentally when is moved from its cache. The boatbill is a small heron with a wingspan of 75 cm, a weight of 600 g and a length of 50-55 cm. The female is slightly smaller. There is no sexual dimorphism in the livery except during the nuptial period when the male adorns its head with a tuft of black feathers, fluttering, filiform that, starting from the occiput go down for some centimetres on the nape. The basic colour of the livery is the ash grey that covers totally the alar mantle and the tail. The head has a black hood that leaves bare the front and the neck that are completely white. Always on the neck, limited only to the rear part, it has a fan-shaped black belt that seems to appear like a small cloak over the shoulders. The chest is whitish with the abdomen slightly reddish even if at times with significantly increased shades. The head is very strong and rounded for a heron but that is the right counterweight of the huge bill nature has given him. A shapeless device similar to the capsized hull of a boat, a big spoon, a sloppy shovel, a wide and flat protuberance, black and hooked on the tip, from which shines through on the upper mandible the defined drawing of a thin bill to which have added on the sides, two wide lips of rounded shape for increasing their capacity. Also the eyes are disproportionate, quite prominent, bulging, with reddish yellowish iris, typical of animals that have adapted to the darkness or to places with poor and attenuated light. The legs are grey tending to the flesh colour. The immatures have a diffusely brown livery with whitish chest and are almost completely missing of the black hood on the head. They reach the adult’s plumage by the third year. Five subspecies typical of the occupied areas have been classified: Cochlearius cochlearius zeledoni western coast of Mexico, Cochlearius cochlearius phillipsi eastern coast of Mexico, Cochlearius cochlearius ridgwayi in southern Mexico up to Panama, and finally Cochlearius cochlearius panamensis Panama to Colombia and the typical form in the rest of the territory up to Argentina. During the nuptial parades typical is the purring and gloomy song almost similar to the croaking of a large frog that emits staying inside its shelters, where it performs courtings that ritualize fights between them, spreading the wings, stretching the neck and churning strongly the huge bill. It is not a strictly social bird as are usually the herons even if it occasionally nidifies in mixed colonies with other species. Actually, it prefers to nidify isolately probably due to the fact that this ardeid is terribly territorial and defends its own nesting area in an unusual way and with a very aggressive character. A behaviour often evidenced also when a human being gets close to the nest. The nidification season varies depending on the latitudes and so we can say that in its territory it nidifies along the whole year. It is a monogamous species but the couple changes each season. 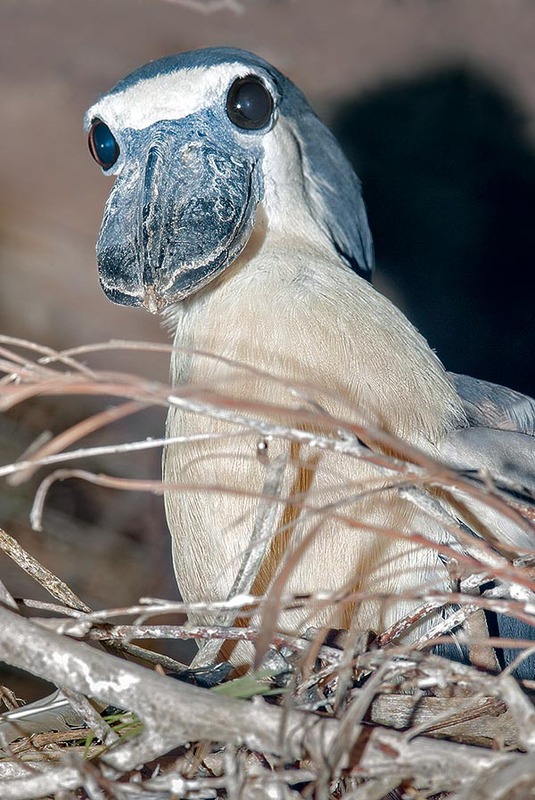 Once chosen the partner, both build up a disorderly platform of small branches on a mangrove branch or on other not high trees overlying a water stream, in which are laid 2 to 4 pale blue eggs. The brooding lasts about 4 weeks and the births are asynchronous so that in the nest can be found chicks of different age. Both parents contribute to the caring and the feeding of the chicks regurgitating their food, as typical to the ardeids, directly into the goiter of the young. The abandon of the nest takes place after 4 and 5 weeks. 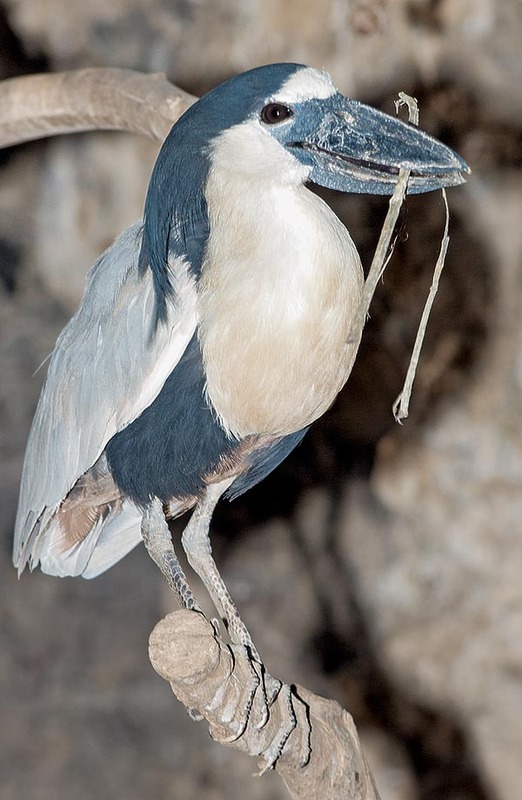 The main diet of this bird is based on aquatic invertebrates, amphibians, molluscs, crustaceans and big insects it hunts using the beak with skill but integrates often the diet with fishes, small rodents and nestlings taken directly from the nests. It is not a species subject to risk even if it has been nited a diffused reduction of their number, survey however hampered by its night habits.